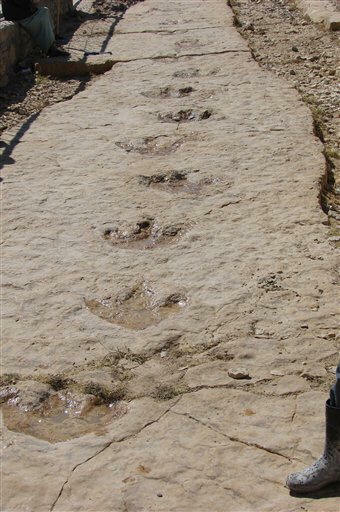 [May 22, 2008] ATHENS, Ohio (AP) -- Scientists say they have found dinosaur tracks on the Arabian Peninsula, a discovery they say may shed more light on where dinosaurs lived, their migration patterns and how they evolved they way they did. The discovery of tracks of a large ornithopod dinosaur and a herd of 11 sauropods walking along a coastal mudflat in Yemen was reported in Wednesday's issue of the journal PLoS ONE. "No dinosaur trackways had been found in this area previously. It's really a blank spot on the map," said Anne Schulp of the Maastricht Museum of Natural History in The Netherlands. Only a few dinosaur fossils have been reported on the peninsula, including isolated bones from Oman and possible fragments of a long-necked dinosaur from Yemen, Schulp said. Schulp conducted the study with Ohio University paleontologist Nancy Stevens and Mohammed Al-Wosabi of Sana'a University in Yemen. Preserved in rocks at the site are the footprints of 11 small and large sauropods -- long-necked, herbivorous dinosaurs that lived in the Jurassic and Cretaceous periods -- traveling together at the same speed. A Yemeni journalist spotted one of the trackways in 2003. Stevens, Al-Wosabi and Schulp identified it as the footprint of an ornithopod, a large, common plant-eater that walked on its hind legs. "It's an exciting find largely because it comes from a part of the world that is poorly known in terms of its vertebrate Mesozoic record," said Peter Makovicky, associate curator of dinosaurs at The Field Museum in Chicago. "This is part of the world with little body fossil record."